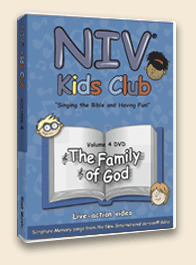 These NIV Kid's Club DVDs are a delightful series where your children will be entertained and learn solid Christian values at the same time! 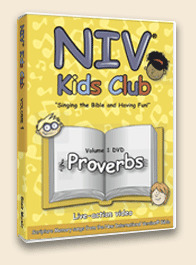 Plus your children (ages 2-8) will have a blast as they easily learn and memorize exact Scripture verses because these songs are not just songs about the Bible! Rather the lyrics of every song are actual Scripture verses taken word-for-word from the New International Version of the Bible. "Since, then, you have been raised with Christ, set your hearts on things above, where Christ is seated at the right hand of God. Set your minds on things above, not on earthly things." "When Christ, who is your life, appears, then you also will appear with him in glory." "Do not lie to each other." "Bear with each other an forgive whatever grievances you may have against one another." Four different volumes from Psalms, Proverbs, Colossians, and Family of God.